Do you have any questions? Then call us on +49 7222 507-0. 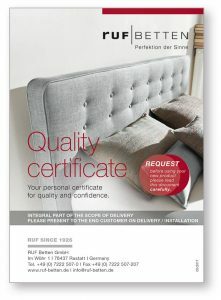 Another RUF service for you: You can download our catalogue here, browse it online, or request a postal delivery. Simply complete the form. How do I best remove red wine stains from my fabric-covered headboard? 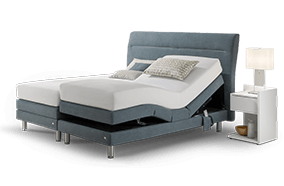 How is an RUF bed created? The RUF Quality Assurance Certificate answers these and many more questions. Your bed should be bring you joy – even when something needs to be disposed of or dismantled. In accordance with the requirements of the “Electrical Code for furniture with electrical components” we have put together all the information you need to easily dismantle the individual elements. We wish you much success.